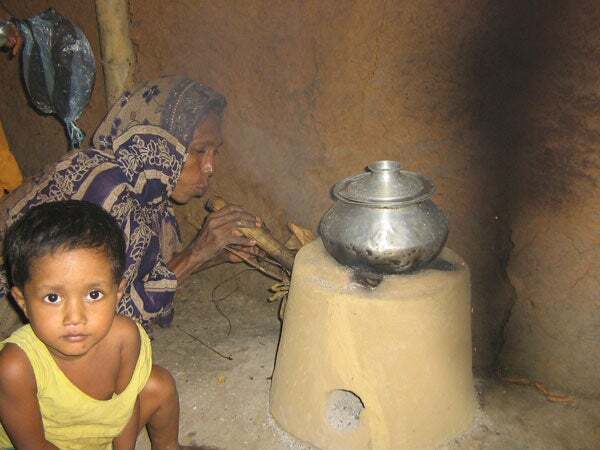 A Bangladeshi woman stokes a flame under a traditional stove. Indoor air pollution from stoves like this have contributed to millions of deaths in the developing world. Preparing a meal in some of the world’s poorest rural areas can turn an ordinary activity into a deadly chore. Animal dung and crop scraps often fuel the indoor fires used for cooking. And before any food fills a hungry belly, thick black smoke fills a family’s lungs. Pneumonia and other acute respiratory infections kill about 1 million people a year in low-income countries, making them the top cause of death in the developing world and the greatest threat to children’s lives. Makeshift stoves belch much of the polluted air leading to those illnesses. About 75 percent of South Asians and nearly half the world’s population use open-fire stoves inside their homes. Governments and humanitarian organizations have urged people to trade their traditional stoves for safer models, many of which have chimneys that funnel smoke out of a home. But the switch from dangerous stoves has been slow to come, even though most people using them know they’re harmful. Miller and his colleagues are studying what’s behind the reluctance and what can be done about it. They suspect much of the problem rests with the widespread approach to clean cookstove conversion, which focuses on educating people about the appliances’ health hazards and offering new models at a low cost. Their most recent findings, published in the Proceedings of the National Academy of Sciences, boil down to this: Clean and modern cookstoves don’t have features people want. And until they’re redesigned, people are unlikely to bother with them. “People don’t think of cookstoves as health technologies,” said Miller, a Stanford Health Policy faculty member at the university’s Freeman Spogli Institute for International Studies. Miller is the senior author of the PNAS paper, which appears online June 11. In the first of two studies, Miller – joined by Yale researchers and Lynn Hildemann, a Stanford engineering professor affiliated with the university’s Woods Institute for the Environment – surveyed about 2,500 women who cook for their families in rural Bangladesh. Nearly all of the women use traditional stoves, and 94 percent of them said they know the smoke from their stoves can make them sick. But 76 percent said the smoke is less harmful than polluted water, and 66 percent said it wasn’t as dangerous as rotten food. When asked what features are most important in a stove, the women talked about things that could save fuel costs, cooking time and the hassle that goes into collecting fuel. “A very small percent said reducing pollution was important,” Miller said. The researchers then tried to assess more directly how Bangladeshis value new stoves. They offered 2,200 customers across 42 rural villages the opportunity to buy one of two models – one boasted improved fuel efficiency; the other had a chimney to reduce exposure to indoor smoke. At the market prices of $5.80 for an efficient stove and $10.90 for the chimney stove, less than a third of customers ordered either model. And when the stoves were delivered a few weeks after the orders were taken, a very small number of families actually went through with the purchase of either model. Large randomized discounts increased customer interest in fuel-efficient stoves but did little to raise purchase rates of chimney stoves. The lead author of the PNAS paper was Ahmed Mushfiq Mobarak, an economist at Yale. It was co-authored by Yale researchers Puneet Dwivedi and Robert Bailis. Their work was supported by the Freeman Spogli Institute’s Walter H. Shorenstein Asia-Pacific Research Center, the Stanford Woods Institute for the Environment and the International Growth Centre. Adam Gorlick is the communications manager for the Freeman Spogli Institute for International Studies.